Mars One's first unmanned mission to Mars will pave the way for future manned missions. One day we'll have a colony on Mars - that's the goal of Mars One, a not-for-profit foundation working on missions to Mars. If all goes as planned, in 2018 Mars One will launch an unmanned mission designed to demonstrate technology necessary for future manned missions. Mars One has contracted Lockheed Martin, an American aerospace, defense, and security company, and Surrey Satellite Technology Ltd. for the robotic mission. Lockheed Martin will build the Mars lander, based on the 2007 NASA Phoenix mission spacecraft that the company also designed, built, tested, and operated. The craft will scoop soil samples, extract water from soil, and test solar panels. The lander will also have a camera to record continuous video recordings. SSTL will build the communications satellite, which will relay data and the live video feed from the Mars lander. In place of government funding, Mars One has been funding the mission through sponsorships, exclusive partnerships, and a future Indiegogo campaign. University students participating in a 2014 contest will be able to propose ideas for the mission, including ideas for experiments or research equipment. "Landing the first humans on Mars should be everyone's mission and not just the mission of one country or organization," Bas Lansdorp, Mars One's co-founder and CEO, said in a press release. "Our 2018 mission will change the way people view space exploration as they will have the opportunity to participate. They will not only be spectators, but also participants. We think it is important to involve people from all over the world in what we're doing, and crowdfunding and crowdsourcing activities are important means to do that." 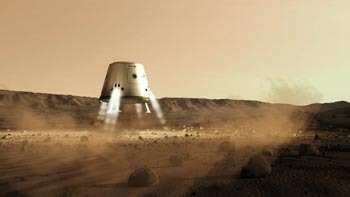 Mars One plans to launch the first Mars crew for a Mars landing in 2024 with their arrival on the planet set for 2025. Everything from selection to colonization will be broadcast to build publicity.